It’s been a dangerously hot summer. Just this week, Lisbon, Portugal, reported its highest temperature ever recorded, 111.2 degrees Fahrenheit. Chino, California, hit an all-time high of 120°F in July. In Quriyat, Oman, temperatures were stuck above 108°F for 51 hours straight. The heat has killed dozens around the world. As we pump more carbon dioxide into the atmosphere and the Earth traps more heat, scientists predict that the severity and frequency of heat waves will continue to increase. Which might lead one to wonder: Is there a way to turn down the planet’s thermostat? One concept gaining momentum is geoengineering: deliberately manipulating the Earth’s climate. Though currently only being tested in very small experiments, it includes solar radiation management — brightening clouds, making the ground more reflecting — and carbon dioxide removal, whether through direct air capture or planting more trees. Geoengineering is highly controversial, with strong proponents as well as detractors. But there’s been little research on it to date since governments are reluctant to fund experiments that pose such large political risks. One proposed experiment, funded in part by Bill Gates, seeks to scatter light-reflecting aerosols from a high-altitude balloon. Fortunately, volcanoes are a handy, excellent model for one form of geoengineering. In big eruptions, they can spew huge quantities of sulfate aerosols into the stratosphere — exactly what some advocates have proposed as a way to block some sunlight and manually cool the planet. Yet as with all forms of geoengineering, this idea has also sparked fears of unintended negative consequences. Now we may have some answers about what they might be if we were ever to try it on a large scale. In a study published Wednesday in the journal Nature, researchers used two past volcanic eruptions to estimate how geoengineering would affect the yield of major food crops. It’s one of the first studies ever to look at the potential consequences of geoengineering using real-world data. And the consequences look pretty serious. “If we think of geoengineering as an experimental surgery, our findings suggest that the side effects of the treatment are just as bad as the original disease,” co-author Jonathan Proctor, a researcher at the University of California Berkeley, told reporters. In other words: When it comes to crops, solar geoengineering could trade one problem (heat-related declines) for another (crop losses due to less light). Let’s back up a minute to why the researchers turned to volcanoes — some of the most awe-inspiring and devastating phenomena in nature — for answers in the first place. The reason is actually pretty simple: The plume from a volcanic eruption can inject millions of tons of sulfur dioxide and ash thousands of feet into the sky. The sulfur compounds can then react with water in the atmosphere to form chemicals that reflect and scatter sunlight, keeping some solar energy from reaching Earth and thereby cooling it. These substances can linger for years, forming a distinct impression in the global climate record. “This would cool the Earth similar to how you might cool yourself down by standing under a tree on a hot day,” said Proctor. Proctor and his co-authors wanted to find out what geoengineering proposals to release sulfate aerosols — as a kind of global dimmer switch — would do to the plants that feed billions around the world. They decided to look at two of the largest volcanic eruptions in the 20th century since these events altered the whole world and had consequences that can be measured. 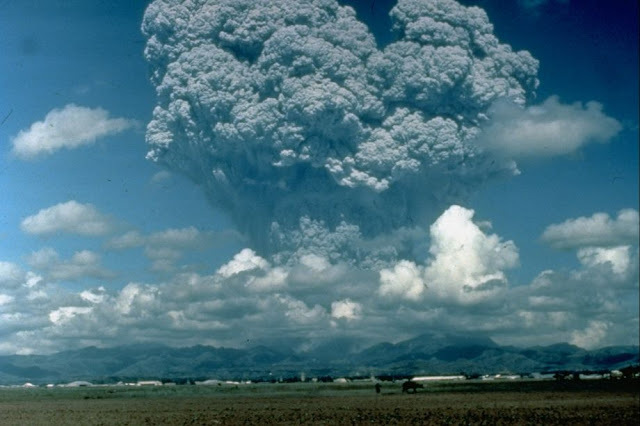 The 1991 eruption of Mount Pinatubo in the Philippines is a case in point. The eruption launched 20 million tons of sulfur dioxide 12 miles up. In the 15 months following the eruption, global temperatures cooled by 0.6 degrees Celsius. The 1982 eruption of El Chichón in Mexico was another volcano that left a mark in the global climate. It was a smaller eruption than Pinatubo, but it cooled the Northern Hemisphere between 0.4°C and 0.6°C. Specifically, the research team examined what happened to maize, soy, rice, and wheat yields in the wake of the Mount Pinatubo and El Chichón eruptions in the years following their eruptions until the volcanic aerosols dissipated. They chose these plants because they are highly sensitive to light and temperature, so eruptions can have a big impact on their yields. The crops are also staples for billions of people — important if you want to estimate the potential societal consequences of geoengineering. They found that the eruptions reduced the amount of direct sunlight hitting the earth but increased the amount of diffuse light. This led to a decline in edible yields from the crops they studied. Global average maize yields declined by 9.3 percent and the harvests of soy, rice, and wheat fell by 4.8 percent after the Mount Pinatubo eruption. Making a similar estimate of the consequences of the El Chichón eruption proved to be more difficult because the data wasn’t as robust. The researchers then simulated what would happen to crops if humanity tried to mimic the sulfur injection into the atmosphere by Mount Pinatubo. They looked at a moderate climate change scenario that projects global emissions will peak around 2040 and then decline. The results showed that geoengineering using sulfate aerosols to manage sunlight would indeed increase crop yields by mitigating some of the losses due to rising temperatures. However, the changes in sunlight exposure would offset these gains, as less light means the plants produce less food. The research team did not expect that the gains and losses from geoengineering would almost completely offset each other. And so “we were surprised by our own results in what seems like the simplest of relationships,” said co-author Solomon Hsiang, who leads the Global Policy Laboratory at UC Berkeley. 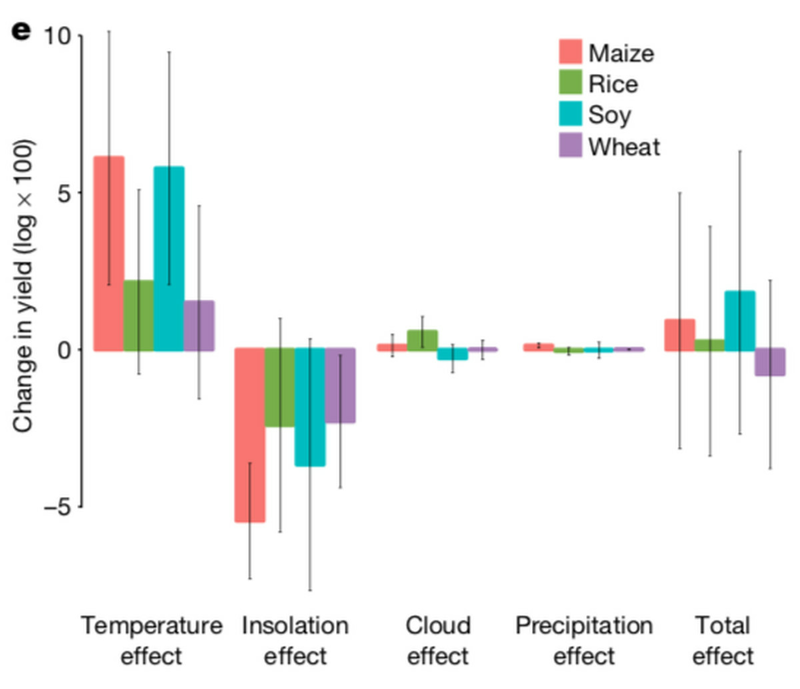 The overall effect is that solar radiation management would do little to reduce crop losses stemming from climate change. Though geoengineering can sometimes seem like an easy, tempting solution to a complicated problem, the results show that it could introduce its own complexities into the climate system. And creating an intervention that influences the whole planet is still a difficult and expensive proposition. Getting the requisite 20 million tons of sulfur compounds into the atmosphere would require a vast logistical network to send dozens of aircraft flights across the sky to spray these aerosols. The researchers estimated that keeping global average temperatures from rising more than 2°C via solar radiation management would require the equivalent of a Mount Pinatubo eruption every year. So there is still the major policy question of whether resources would be best spent mitigating our impacts on the world now, adapting to the changes in store, or preparing a counterattack. Gernot Wagner, the executive director of Harvard University’s Solar Geoengineering Research Program, who was not involved in the study, said the findings show that no one strategy, no matter how extreme, can single-handedly resolve all the problems associated with changes in the climate. That means even in a scenario where the world is looking to shield itself from the sun, there’s no getting around making drastic cuts to greenhouse gas emissions. The study’s authors say there could still be other benefits from geoengineering — for instance, saving lives from extreme heat — that could outweigh the costs. But that requires further investigation.